Did you know? Kidney disease kills more Americans every year than either breast cancer or prostate cancer. High blood pressure and diabetes are the main causes of chronic kidney disease. Some 468,000 Americans depend on dialysis. Coenzyme Q10 supplements can reduce the risk of oxidative damage to the cells and can reduce the risk of damage to the heart muscle for dialysis patients. Supplementation of patients undergoing maintenance dialysis with 1200 milligrams of Coenzyme Q10 for four months has been shown to be safe and effective at reducing a bio-marker of oxidative stress [Rivara]. Super, I thought, when I read this report, which appeared in the medical journal The American Journal of Kidney Diseases. The journal is the official journal of the National Kidney Foundation. 1200 milligrams a day. That is four times the daily dosage used in Dr. Mortensen’s Q-Symbio study of chronic heart failure patients. Six times the daily dosage used in Dr. Alehagen’s KiSel-10 study of elderly Swedish citizens. And 1200 milligrams per day were safe and well tolerated. Good news. Not surprising news but good to see confirmed. The study of Coenzyme Q10 for dialysis patients was done by researchers at the Kidney Research Institute and the School of Pharmacy at the University of Washington, in Seattle, and researchers in the Division of Nephrology at Vanderbilt University Medical Center in Nashville. Their study gives hope that future studies will show clinical benefits of Coenzyme Q10 supplementation for dialysis patients in addition to the reduction of oxidative stress and damage. The study was a randomized, double-blind, parallel-group, placebo-controlled clinical trial. It was designed to compare Coenzyme Q10 antioxidant therapy at two different daily doses (600 and 1200 milligrams per day) with matching placebos. Throughout the four-month study, the patients continued to receive their normal dialysis care as prescribed by each patient’s nephrologist. The researchers assigned the eligible study participants to one of the three study groups in a 1:1:1 ratio. 58 study participants completed the four-month study. The researchers collected fasting blood samples at baseline and at 1, 2, and 4 months. The primary outcome was the change in levels of the plasma bio-markers of oxidative stress, F2-isoprotanes, from baseline to the end of the study. Would the Coenzyme Q10 supplementation reduce the plasma F2-isoprotanes level? Note: Increased plasma concentrations of F2-isoprotanes are considered to be a sensitive direct marker of free radical oxidative damage to cell membranes in humans [Sampson]. Moreover, plasma F2-isoprostane levels are known to be elevated in chronic hemodialysis patients [Ikizler]. Compared to study participants in the placebo study group, study participants in both the 600-milligram and the 1200-milligram study groups had significantly higher mean plasma Coenzyme Q10 concentrations after four months of supplementation. Interestingly, there was a significantly higher mean Coenzyme Q10 redox ratio in the 1200-milligram per day study group as compared to the placebo study group. There was a trend toward but not a significant difference in mean Coenzyme Q10 redox ratio between the 600-milligram per day study group and the placebo study group. Note: The Coenzyme Q10 redox ratio is the ratio of reduced Coenzyme Q10 (called ubiquinol) to oxidized Coenzyme Q10 (called ubiquinone) in the plasma. The study participants assigned to the 1200 milligrams per day study group had significantly lower mean plasma concentrations of F2-isoprostanes during the four-month treatment period, compared to the participants in the placebo study group. This was an important finding. The study participants assigned to the 600 milligrams per day study group showed a trend towards lower mean plasma concentrations of F2-isoprostanes, compared to the participants in the placebo study group. However, the difference was not statistically significant. There is more good news in the Coenzyme Q10 and dialysis study. In addition to the finding that Coenzyme Q10 supplementation significantly reduced the levels of a plasma bio-marker for oxidative stress, the researchers reported that they observed a reduction in the plasma concentrations of troponin T and NT-proBNP with Coenzyme Q10 supplementation [Rivara]. Troponin T is a specific bio-marker for heart muscle damage. NT-proBNP levels are a bio-marker for risk of heart failure. Overall, the daily Coenzyme Q10 supplements were well-tolerated by the study participants. There was no statistically significant difference in the numbers of adverse events – on the order of 1/2 to one event per patient-year – among the three study groups. The researchers compared the mean systolic and diastolic blood pressures of the study participants in the two Coenzyme Q10 supplementation study groups with the mean blood pressures of the study participants in the placebo group. There were no statistically significant differences in mean blood pressures between the placebo study group and either of the two Coenzyme Q10 supplementation study groups. Coenzyme Q10 supplementation did not adversely affect blood pressure in any way. Why Coenzyme Q10 supplementation for dialysis patients? 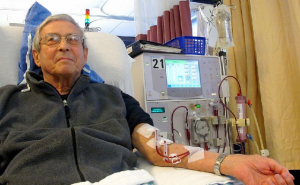 Dialysis patients are known to have elevated levels of oxidative stress. Coenzyme Q10 is an important fat-soluble antioxidant, reducing the extent of oxidative damage. Dialysis patients are known to have low Coenzyme Q10 concentrations. Coenzyme Q10 is safe and well tolerated even at higher doses. In a separate study, doses as high as 1800 milligrams per day were shown to be safe for dialysis patients [Yeung]. Patients with kidney diseases are known to suffer dysfunction of the mitochondrial bio-energetic process. Coenzyme Q10 is an essential component of the mitochondrial process of energy production. Coenzyme Q10 is readily available and affordable. Ikizler, T. A., Morrow, J. D., Roberts, L. J., Evanson, J. A., Becker, B., Hakim, R. M., & Himmelfarb, J. (2002). Plasma F2-isoprostane levels are elevated in chronic hemodialysis patients. Clinical Nephrology, 58(3), 190-197. Sampson, M. J., Gopaul, N., Davies, I. R., Hughes, D. A., & Carrier, M. J. (2002). Plasma F2 isoprostanes: direct evidence of increased free radical damage during acute hyperglycemia in type 2 diabetes. Diabetes Care, 25(3), 537-541.